The FBC Thompson region often supports projects for the sustainable management of watersheds and natural resources. Here are examples of past partnership events in this region. Contact us for more information. 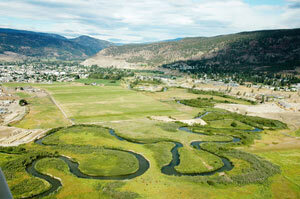 An aerial view of the serpentine coils of the Nicola River at Merritt. Photo courtesy of Picture BC. The Coldwater Indian Band and Fraser Basin Council co-hosted a workshop in Merritt on October 19-20, 2011, offering participants a closer look at connections between human health and local ecosystems, opportunities to integrate science and traditional ecological knowledge in watershed management, and ways to forge stronger working relationships among First Nations, watershed managers, environmental health officers and others. Here’s a look at the workshop summary. On March 30 and 31, 2011 the Fraser Basin Council, Environment Canada and Southern Interior Beetle Action Coalition hosted "Fostering Collaborative Responses to Hydrological Changes in the Nicola Watershed." The workshop explored several key issues: What are researchers finding out about hydrological changes caused by the Mountain Pine Beetle infestation and a changing climate? What are the real-world impacts? How can we enhance collaboration to respond to these impacts and minimize them? All presenters and participants — 50 in all, from multiple sectors —shared their expertise and experience. They also worked on identifying information gaps and canvassing opportunities for greater collaboration on water allocation, land use planning, and fisheries and ecosystems. The workshop brought together ranchers, agrologists, hydrologists, engineers, foresters, elected officials, elders, students, concerned citizens and other interested people across several sectors. Read more in the workshop summary. recommendations for further research and multi-interest collaboration.